Review by Andrew Taylor, Nottingham, England. It's always a good start when opening a book of poems, in this case a debut collection of poems, to get along with the first thing that greets you. The poem 'Just by Chance' locates the reader in Limerick (Ireland) 'on an average Wednesday' but the poem is distinctly un-average. O’Dwyer has a good eye and as the collection develops we see these observations come to the fore. Again, the theme of love is present. A particularly strong poem is ″The Red Window’ Poems″. Moving away from punctuation and offering an almost Williamsian approach to line length, the poem (it has a dedicatee – Kerry Hardie) is perfectly placed in the collection in terms of ordering. The collection slows a little at this point, which is always a good thing. This shows a certain maturity in a writer who is relatively young (O’Dwyer is in his early 30s). The poem starts with the stark line ‘Illness kept her there’ the domesticity of the scenario is made clear in the third stanza ‘the room filled / by the uncertain-of-itself light / of winter afternoons’. The sound of the wind which enters the room ‘picking itself up slowly / pained’ brings us back to the illness of the opening line. The final stanza is excellent. The pained wind ‘lifting a poem / into the red frame’, with its sense of movement tinged with sadness as the poem seeks to remove itself from the situation. Stirring stuff. O’Dwyer moves away from the theme of love on occasion. This too, is welcome. 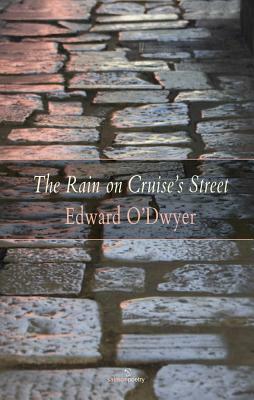 ‘The Rain on Cruiser’s Street’ is a long collection. As with all debut collections (as with debut albums/CDs) there is often a desire to highlight the best poems one has written to date. In a longer collection such as this, sometimes pruning (and saving) some poems is advisable. There is a really strong collection of love poems in this book and perhaps when O’Dwyer shifts away from these poems, the collection seems stronger. of a Winter’s frozen blade. from a lover’s pink nose. This is a wonderful image to finish with. Overall, this is a strong collection with some sterling poems. There is a sense that fewer poems would have benefitted the collection as a whole. This is quite common is debut collections and should not put off any potential readers who enjoy vivid, imagistic work. O’Dwyer is a poet whose work rewards re-reading and further engagement.